A hex sign called an Irish hex sign by Jacob Zook. When William Penn, the founder of the state of Pennsylvania, and himself a Quaker, encouraged European settlers who wished to escape religious persecution to settle in the state, many groups from Germany and Switzerland, including Lutherans and Reformed sects, and also Amish, Quakers and Mennonites settled in the southeastern part of Pennsylvania. These people came to be known as the Pennsylvania Dutch, "Deutsch" refers to their German language. Hex signs are a type of folk art that became common in Pennsylvania Dutch country, as the area is still called. It is believed that the hex sign evolved from an earlier form of folk art, the Fraktur, a highly stylized document predominantly taking the form of a personal family record, popular among the Pennsylvania Dutch. Hex signs are highly stylized and geometric. Although individual designers often take liberties with it, there is a general pattern embracing a six-sided figure within a circle. While hex signs, in all likelihood, were originally displayed only for aesthetic purposes or to emphasize the rich heritage of their creators' home country, they have come to be imbued, both by Pennsylvania residents and visiting tourists, with mystical, almost magical powers and some see them as a useful tool for warding off evil spirits, lightning, and various other negative circumstances. As is the case with any good luck charm or amulet, if the bearer believes that it holds protective powers, to a certain extent, it is bound to do so. Just as a Bible or a cherished photograph brings positive and powerful thoughts to a person who holds it valuable, images and symbols have the power to protect and attract good spiritual energy to the extent that the people who view them believe that they do. Hex signs are examples of good luck symbols that developed in nineteenth century Pennsylvania and remain popular today. There are two opposing schools of belief regarding the derivation of the term "hex sign." Those that support the occult nature of the signs assert that the term "hex" derives from the Pennsylvanian German word, Hex (German Hexe), meaning "witch." By contrast, supporters of the folk-art theory point out that the most popular hex signs were six-sided, brightly colored geometric designs, termed hexagram, from the Greek root hex-, meaning "six." Wallace Nutting was the first person known to refer to these motifs as hexafoos meaning "witch foot" in his photography book Pennsylvania Beautiful (Eastern), published by Old America Company in 1924. Like many kinds of post-colonial American folk art, hex signs find their origins in Europe, specifically the Rhine region of Germany, from where people emigrated to settle in southeastern Pennsylvania. These immigrants, over time, came to be known as the "Pennsylvania Dutch." While hex signs themselves appear to have no mystical meaning, the various European folk art that inspired them may. Painting or mounting "hexing signs" dates back to the pre-Christian era in Europe, when symbols and designs derived from or pertaining to the runes first appeared on buildings to invoke magical powers, either to hex (wish someone bad luck) or bring about good fortune. Over time, the practice took on several new meanings, especially as the number of those recognizing the old Germanic pagan religions declined; for some, the practice came to be about art and tradition; for others, even though the sign-creating was less ritualistic, it still retained an element of the search for "good luck," especially for those concerned with good fortune in crop cultivation. 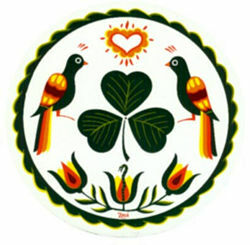 One example of a good luck symbol is the distelfink, which appears on many hex signs. A stylized goldfinch which represents happiness and good fortune; in its modern form the distelfink often has a stylized crest on the bird's head of three lines each ending in a dot (see example below). A 1788 example of a baptismal certificate Fraktur, a precursor to the Hex Sign. Many consider the Fraktur, a document used by the Pennsylvania Dutch to keep track of family histories and important dates, a forefather to hex signs. Fraktur drawings were executed in ink and/or watercolors and are found in a wide variety of forms: the Vorschriften (writing samples), the Taufscheine (birth and baptismal certificates), marriage and house blessings, book plates, and floral and figurative scenes. The earlier Fraktur were executed entirely by hand, while printed text became increasingly common in later examples. Common artistic motifs in Fraktur include birds, hearts, and tulips. Fonts included in frakturs included numerous variants of calligraphy, especially italic and old English calligraphy. Frakturs were most common between 1740 and 1860. The hex signs which developed from them, beginning in the nineteenth century, were simpler and more purely artistic than frakturs, designed to display familiar images rather than specific information. Typical hex sign on a barn. 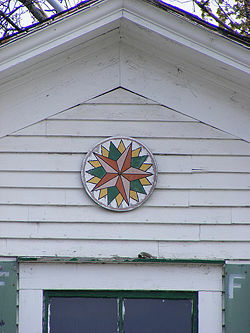 Today, artfully painted octagonal or hexagonal star-like patterns are a well-known sight on Pennsylvania Dutch barns, especially in Berks County, and Lancaster County, Pennsylvania. However, the modern decoration of barns is a late development in Pennsylvania Dutch folk art. Prior to the 1830s, the cost of paint meant that most barns went unpainted. As paint became affordable, the Pennsylvania Dutch began to decorate their barns much like they decorated items in their homes. Recent scholarship suggests that hex signs developed as a kind of "ethnic symbolism." That is, the Pennsylvania Dutch, proud of their heritage and culture, wanted to prominently display something unique to their heritage, and hex signs began appearing on Pennsylvania barns and houses in increasing numbers. Barn decorating reached its peak in the early twentieth century, at which time there were many artists who specialized in barn decorating. Drawing from a large repertoire of folk designs, barn painters combined many elements in their decorations. The geometric patterns of patchwork quilts can easily be seen in the patterns of many hex signs. 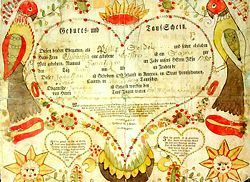 Hearts and tulips seen on barns are commonly found on elaborately lettered and decorated birth, baptism, and marriage certificates known as Fraktur. Some view the designs in hex signs as decorative symbols of ethnic identification, possibly originating in reaction to nineteenth century attempts made by the government to suppress local use of German, the Pennsylvania Dutch language. Until the early twentieth century, hex signs were limited primarily to those painted directly on barns and other buildings. However, with advances in silk screening and printing that made them easier to mass produce, in the 1930s and 1940s, their popularity grew. Mass produced hex signs could be purchased separately and hung on farms or houses, and curious tourists became even more interested. Hex signs then began to appear on items created or sold throughout the area, almost becoming a logo for the Pennsylvania Dutch, so that consumers would know who had created the products.Mennonite folk artist Jacob Zook of Paradise, Pennsylvania, holds the claim to having originated the modern mountable painted sign in 1942, based on traditional designs, to be sold in the family souvenir store to tourists along the Lincoln Highway. There are many different hex sign designs. Some of the most common are listed below; however, the number of different hex signs is limited only by human creativity. The most common elements in hex signs are symbolic motifs of birds, leaves, tulips, and other flowers, as well as symmetrical geometric designs. 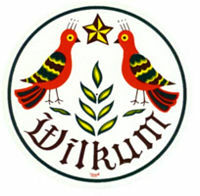 Hex sign displaying the Wilkhommen design. Typically consists of a large red heart in the middle and paired tulips around the edges. The heart represents a loving home, while the tulips represent the importance of friends, family, neighbors, and community. Often a bird is placed over the heart, in effect, watching over the home and bringing it good luck. The Wilkhommen design is one of good feelings, conveying a happy home and a strong community. Hex sign with a tulip star pattern. This design, generally one of the more familiar and popular, features a star, typically blue, with eight points, laid out symmetrically. Red tulips and sheaves of wheat are placed between the star's points, in an alternating pattern. The tulips symbolize faith in humanity and trust, while the star and the wheat represent abundance and goodwill. There is also a smaller eight pointed star in the center of the design. 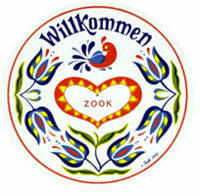 Hex sign with distelfink, a Wilkum design. The word "Wilkum" (a variation of the German word willkommen) is written in stylized letters on the bottom of the sign, extending a warm welcome to all. Stylized German birds, specifically distelfink birds, flank the letters on either side, with a star near the top, along with some greenery near the bottom. The birds represent happiness and good fortune for all, while the star and grass represent good luck. A Tree of life hex sign. 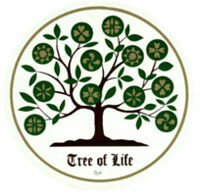 The tree of life design is one of the more unusual hex signs, presenting a large, stylized tree with fruit; the fruit is decorated using more typical hex sign designs, such as an eight pointed star, tulip, and a heart, among others. The tree is a symbol for God's plentiful fruit. There is a circle surrounding the hex sign, which represents through its uninterrupted nature, everlasting life. The general theme of the tree of life is "love and happiness for all." Although there is a common misconception that hex signs are related to Amish culture, typically, Amish vehemently disassociate themselves from hex signs. All of the Anabaptist sects, including both Mennonites and Amish (a reformed branch of Mennonites) in the region have a negative view of hex signs. Thus, it is not surprising that hex signs are never seen on an Amish or Mennonite household or farm. There is also a good deal of debate as to the use and intentions of hex signs. There is very little evidence to support the idea that hex signs were created with mystical or magical purposes in mind. Yet, the "hexing designs" in pre-Christian Europe intended to ward off lightning, fire, and other natural elements, make it a difficult claim to completely dismiss. Modern mystics see the hex sign as amulets or talismans that hold magical powers. However, there is little evidence to support the idea that when hex signs appeared on nineteenth and early twentieth century farms they were put there for any reason other than purely aesthetic, ethnically oriented ones. Most modern scholars reject such mystical claims and see hex signs only as highly stylized folk art, which, in their eyes, does not diminish their value or beauty. Hex signs are also useful as a key for understanding the culture of some of the first settlers to Pennsylvania. Because a great deal of myth surrounds hex signage, one must be careful to sift through legend and understand the facts. Whether or not they were designed with mystical powers in mind, hex signs occupy an important place in the Pennsylvania Dutch heritage. ↑ 1.0 1.1 1.2 1.3 1.4 1.5 1.6 Your Lancaster, Hex signs. Retrieved June 24, 2008. ↑ Explore Pennsylvania History, Fraktur. Retrieved June 24, 2008. ↑ Pennsylvania Dutch Country Welcome Center, The History of Hex Signs. Retrieved June 24, 2008. 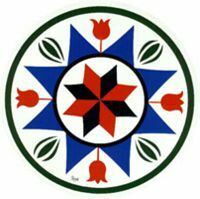 ↑ 4.0 4.1 4.2 4.3 4.4 Amish Country News, The Story of the Hex Sign. Retrieved June 24, 2008. ↑ Amish News, Story of the Hex Signs.. Retrieved June 24, 2008. ↑ Zook's Family Crafts: the Hex place. .hexsigns.com. ↑ Amish News, The Story of Hex Signs. Retrieved June 24, 2008. ↑ The Mystica, Hex signs. Retrieved June 24, 2008. Graves, Thomas E. The Pennsylvania German Hex Sign: A Study in Folk Process. Unpublished Ph.D. dissertation in Folklore & Folklife, Univ. of PA, 1984. Yoder, Don, and Thomas E. Graves. Hex Signs: Pennsylvania Dutch Barn Symbols and Their Meaning, 2nd edition. Mechanicsburg, PA: Stackpole, 2000. All links retrieved December 24, 2017. This page was last modified on 24 December 2017, at 20:07.